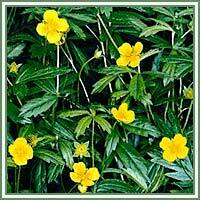 Habitat: Common Tormentil is native to Europe, western Asia and North Africa. It can be found in pastures, heaths, open woods and moorlands, preferring light acid soils. 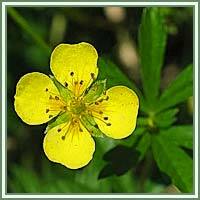 Description: Common Tormentil is a herbaceous perennial plant, growing 10 to 30 centimeters tall. It has erect and slender stems and pinnately compound, glossy leaves. Leaves have three obovate leaflets with serrated margins. Leaves on the stalks are sessile and with shorter petioles than the radical ones. Flowering occurs from May to September. During this period a single flower appears at the tip. The flower is yellow and four-petaled. Useful components: Tormentilline, bitter quinoric acid, catechol-tannins, resin, gum. Medicinal use: Common Tormentil is considered to be a very good astringent and tonic. It is a very beneficial remedy against acute and nervous diarrhea, and can relieve symptoms of mucous and ulcerative colitis. It is also useful in treatment of constipation. Quinoric acid found in Common Tormentil is a powerful agent against malaria. Used as a gargle, the plant expresses its astringent properties and helps in cases of mucous membranes inflammations. It can be also very helpful in the treatment of laryngitis, pharyngitis, bleeding gums and mouth ulcers. Used in a douche, Common Tormentil can be helpful in cases of vaginal infections. It can ameliorate the healing of wounds and cuts. A decoction is said to help in case of conjunctivitis. Safety: Some herbs could react with certain medication. Therefore, it is highly advisable to consult your doctor before consumption of any herb.